This is my favorite recipe for pasta sauce. I am trying to avoid the store bought kind because there is so much sugar in it, but it is so convenient. 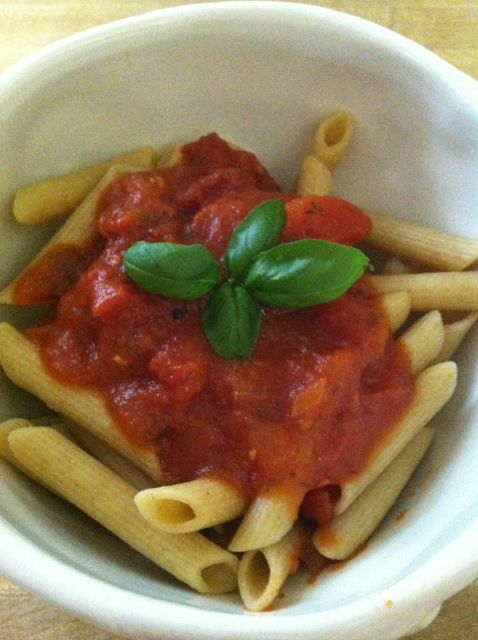 This sauce is really quick to make because I used canned tomatoes (try to find an organic brand). Right now I have tons of basil in my little garden, so I think I will be making this a lot. This makes a big batch of sauce, but you can always freeze the leftovers or cut the recipe in half. Heat the olive oil in a large skillet over medium heat. Add in the onion and cook about 5 minutes until it is translucent. Add in the garlic and cook for another minute. Pour in the crushed tomatoes, tomato paste and water. Stir it well to mix in the paste. Bring the sauce up to a simmer and add in the basil, Italian seasoning, salt and pepper. Simmer it for 20-30 minutes then remove from the heat. Serve the sauce over your favorite pasta. 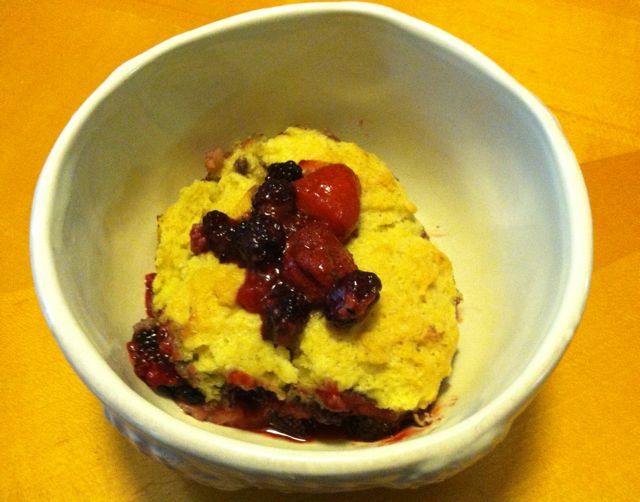 Another berry recipe! We have so many berries it is unbelievable, so I have been trying to use them in everything. Saturday morning we even had blackberry pancakes. 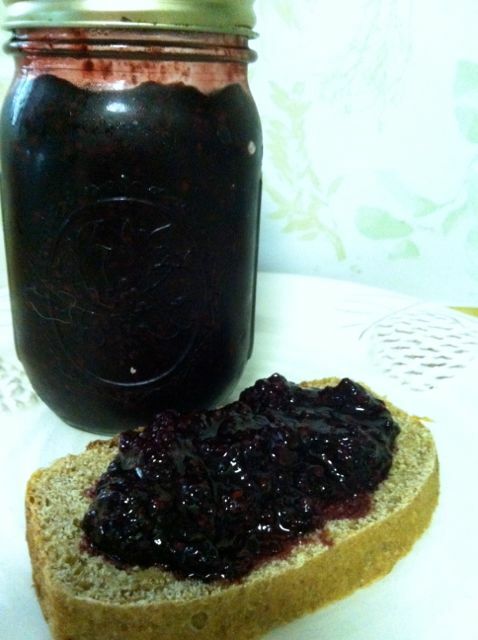 Today I decided to make some jam with some of the blackberries. The kids were really excited for it. We usually don’t use jam or jelly just because it has so much sugar in it, but I couldn’t resist since we have such sweet fresh berries. I don’t have a canner, so I only made enough for one jar. You can use this same method to make jam with any berries that you like. It will last in the fridge for about a week, but I don’t think our jam will make it that long. I can’t wait for toast in the morning! Combine the berries and the sugar in a medium saucepan. Cook them on high heat for about 5 minutes and then turn down the heat to medium. Cook the jam for another 15 minutes stirring frequently. Remove it from the heat and let it cool a little. Carefully spoon it into a jar or heat proof container and let cool completely. Refrigerate or freeze. Please let me know what some of you favorite berry recipes are! 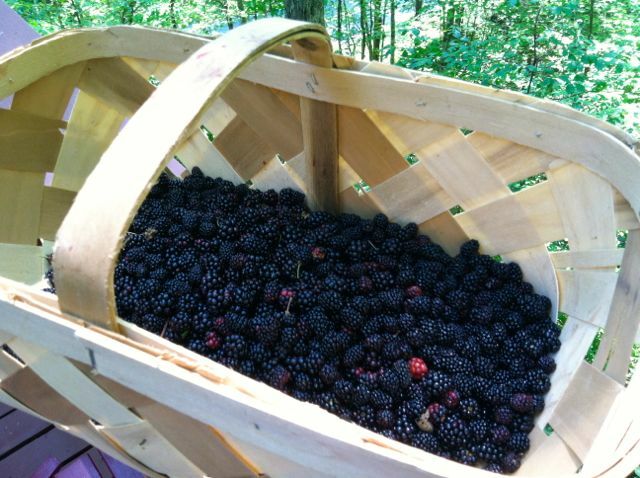 The wild blackberries are all ripe where we live. This was just one of the three baskets that we picked. Needless to say we have a ton of berries already and there are a lot more to pick in the next few weeks. After a few hours of picking, we decided to make cobbler. Blackberry cobbler is on of my Dad’s favorite desserts, so he was super happy. The cobbler is great as is or with vegan vanilla ice cream. Preheat the oven to 375. Lightly grease a large baking dish. In the dish combine the berries, sugar and flour. For the topping: In a large mixing bowl mix together the flour, sugar, baking powder, baking soda and salt. Add in the shortening and mix it in with your fingers until it feels course. Add in the milk and mix it in with a fork just until it is combined. It should be a wet dough. Spoon the dough on top of the berries. Bake the cobbler about 25 minutes until the top is lightly browned. Remove it from the oven and let it cool at least 10 minutes before serving. Since I found fresh peaches at the farmers market this week. 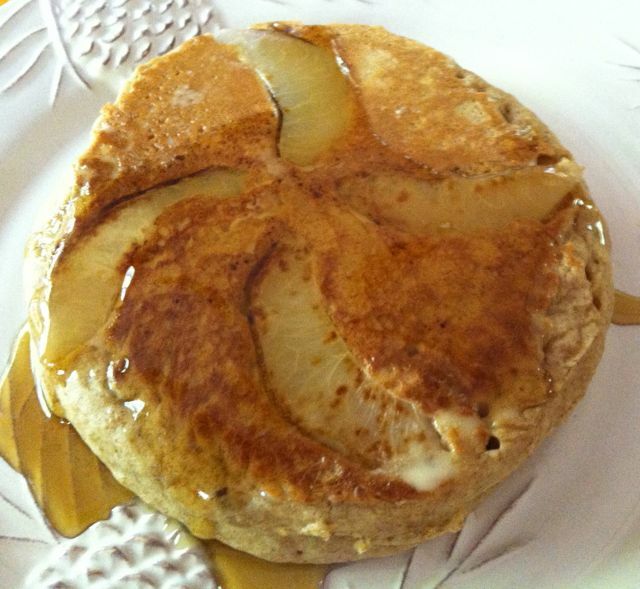 Peach pancakes had to be on the menu. We have a strawberry farm close to us, so for a few weeks we had tons of strawberries. We actually bought so many that I had to freeze some because we could’t eat them all. I made this pie to help use some of the berries and it was a delicious way to use them. 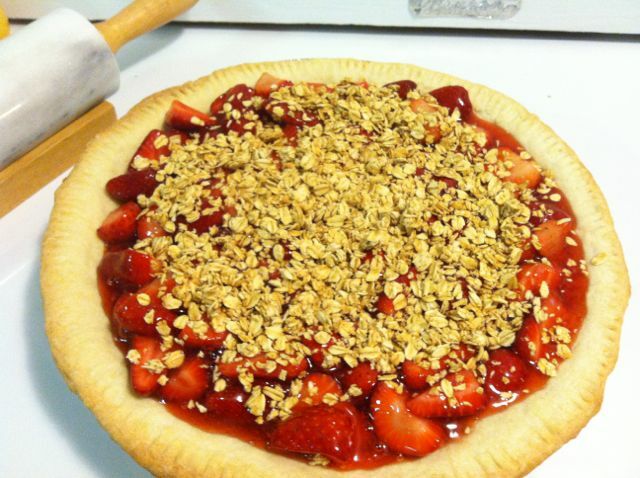 The crust was nice and flaky and was filled with fresh sweet strawberries. I topped the pie with a little granola just to give it a little crunch. The basic recipe for this pie actually came off the bottom of an old pie dish that my mom had. Preheat the oven to 375. Place prepared dough in the pie pan and trim it to fit. Cover the bottom with parchment and then cover it with pie weights or some dried beans to keep it form puffing up while it is baking. Bake the pie crust about 15-20 minutes until it is golden brown. Remove from the oven and let it cool completely. Dissolve the cornstarch or arrowroot in 1/3 cup of water. Mash about 1 cup of the berries in a small bowl. Bring 1 cup of water to a boil in a medium saucepan and add in the mashed berries. Let boil of a few minutes and then add in the sugar. Stir until all the of the sugar has dissolved. Add in the cornstarch mixture and stir until it becomes clear. Remove from the heat, strain out the pieces of strawberry and let cool completely. Once the glaze is cool mix it with the rest of the strawberries. Pour it into the crust and then refrigerate the pie for at least 30 minutes. Top with granola just before serving. Last week we went camping for a few days. The weather was gorgeous and we had a blast. These lentil burgers are very hearty and filling. 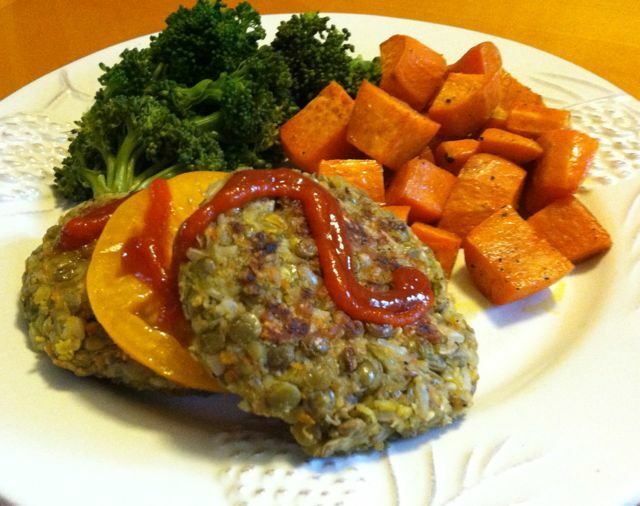 The lentils give the burgers a meaty flavor and add lots of protein. They would be great done on the grill for a BBQ this summer. Bring 1 cup of water or vegetable broth to a boil in a medium pot. Add in the rice, cover and turn the heat down to low. Cook the rice for about 45 minutes. While the rice is cooking cook the lentils. Bring about 3 cups of water or broth to a boil and add in the lentils. Turn down the heat and simmer the lentils for about 25 minutes until the lentils are tender. Finely chop the onions, carrots and garlic in the food processor. Heat 1 TBSP of the oil in a skillet and add in the veggies. Cook them for about 5 minutes. Add the cooked veggies into a large mixing bowl with the oats, seasoning, salt and pepper. When the rice and the lentils are finished cooking put about 3/4 of it into the food processor and grind them a little. You want it to have a little texture still. Add the pureed and the whole rice and lentils into the mixing bowl and mix it all together with you hands. Form the lentil mixture into burgers. 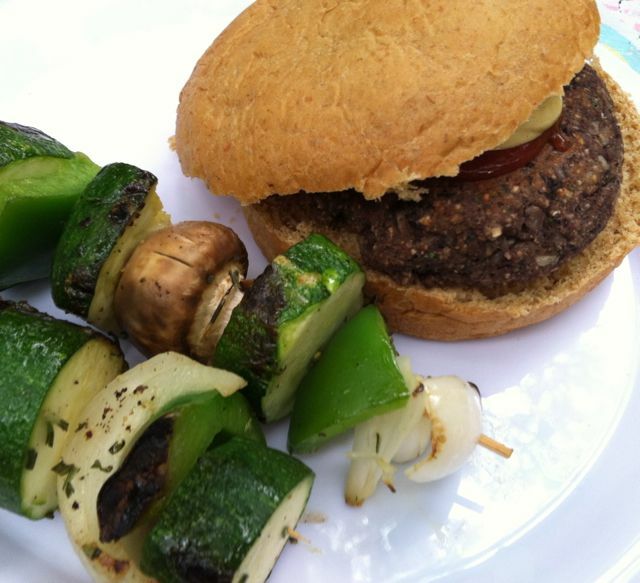 Heat the oil in a large skillet and cook the burgers about 5-7 minutes on each side until they are golden brown. Or you can brush the burgers with oil and cook them on an outdoor grill.